What did you get dad this year? We have an amazing new product from VTech to tell you all about. Not only will dad love it, but it's something the whole family will benefit from. 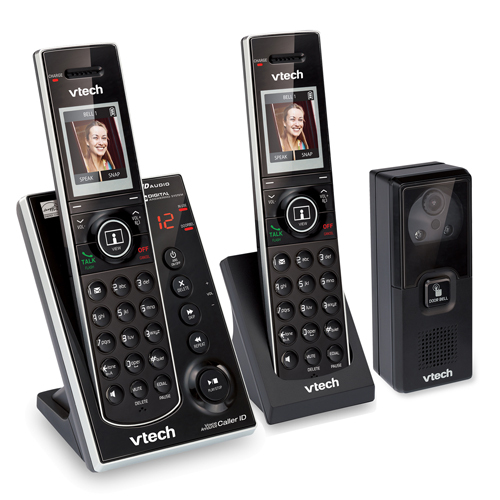 In honor of National Safety Month we are excited to tell you about VTech's new Audio/Video Doorbell --the IS7121-2. The first of it's kind, this 2-in-1 cordless answering system and audio/video monitor combines a versatile phone with a digital camera for an increased sense of security. It's a Phone, It's a Doorbell, It's a New Kind of Convenience. The Video Doorbell is ideal for discretely protecting your privacy, and your home. Streaming and Still Images-- The camera automatically snaps a photo and sends it to the phone handsets when visitors ring the doorbell so you can see who is there. You can then decide if you want to stream video and/or enable the microphone to be used as an intercom system, which allows you to talk to the visitor without opening the door. Both can be done with just two buttons. Offers Wide-Angle, Adjustable Camera Lens and Automatic Night Vision for clear images of visitors even in the dark! 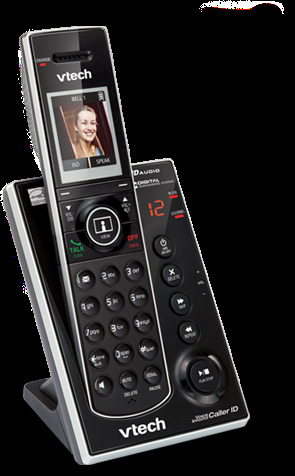 Cordless Answering System-- Never miss a call with a digital answering system. Enjoy high-quality calls with HD Audio. Always know who's calling with Voice Announce Caller ID. Push-to-talk technology allows you to instantly communicate with any or all of the handsets in your home. It's sad to say, but today we live in a world where it's not even safe to answer our doors when strangers ring our doorbells. So when VTech introduced me to their new Audio/Video Doorbell I got excited! When my husband isn't home and it's just me and the boys' I absolutely won't answer the door if I don't know who it is. Unfortunately, it's just not safe to do so anymore, but now withVTech's Audio/Video Doorbell that problem is solved. Now when someone rings our doorbell we can instantly see who it is by simply looking at one of our cordless phone handsets. I LOVE that I don't even have to go to the door and let the visitor see me while trying to see who is here. After looking at their picture I can decide if I want to stream video of the visitor at my door and I can choose whether or not I want to answer them or talk to them through the handset like it's an intercom system. I never have to open my door and sacrafice the safety of myself or my family when someone arrives again. Even if I'm in another room, I can instantly see who is there without them ever knowing I'm home. I also love that is stores 100 photos. Even if we are not home and someone rings the bell it still takes a picture of them for us to see when we return --how awesome is that! The phone comes with 2 cordless handsets. One with the Answering System Base and the other is just a cordless phone that you can plug in anywhere you want, like a different room than the base. If you have Caller ID it announces who is calling through the speakerphones. Another great feature that we love is that you can also use each handset as a walkie-talkie so that you don't have to scream through the house, it allows you to communicate with family members in a different room through the phone. I've shown several family members our new Audio/Video Doorbelland they all want one. Who wouldn't want to be able to see who is at their door without actually opening it. You can now discretely screen visitors, see if they are strangers or friends and family before deciding to let them know that you're home or not. Talk to them through the intercom and watch them on video through your safely locked door. It's great for anyone-- families, older kids who are home alone and perfect for the elderly. Now that we have this, I could never live without it! It's very affordable and expandable up to 10 Handsets and 2 Camera/Doorbells. This is absolutely one of my favorite products as keeping my family safe and protecting them is a high priority. We highly recommend it! 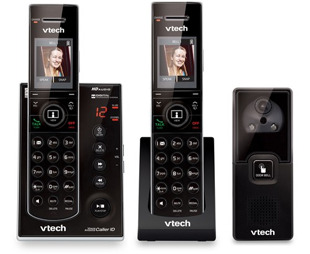 Disclaimer: The Jackson Five Family Blog received a complimentary product sample from VTech Phones to facilitate this reader review and giveaway. However all opinions are honest and our own! Originally published on 2013-06-16 by Jenna at Jackson Five Family .